The global population is expected to increase by two to three billion people by 2050, a projection raising serious concerns about sustainable development, biodiversity and food security. Today, more than half of the world's population is nourished by food grown with fertilizers containing synthetic nitrogen, which is needed to produce high crop yields. Plants take the nitrogen they need to grow, and the excess is left in the ground, water and air. This results in significant emissions of nitrous oxide, a potent greenhouse and ozone depleting gas, and other forms of nitrogen pollution, including eutrophication of lakes and rivers and contamination of drinking water. Given the world's growing food demands, nitrogen fertilizer use is likely to increase. Using too much fertilizer, however, will lead to increased pollution of waterways and the air. What's needed is a more efficient use of fertilizer, which will benefit both food production and the environment, according to a study published in Nature. Led by Princeton University, the paper is among the first to globally analyze "nitrogen use efficiency" - a measure of the amount of nitrogen a plant takes in to grow versus what is left behind as pollution. 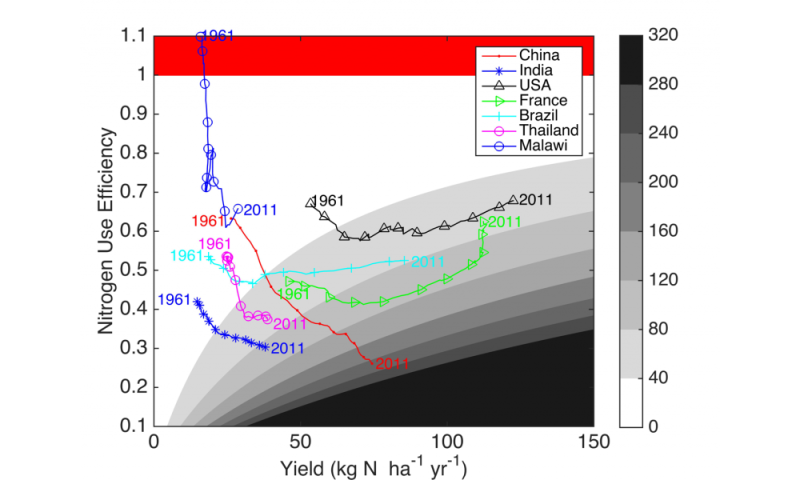 Looking at fertilizer and crop harvest data in regions like the United States, Western Europe and Sub-Saharan Africa, the researchers examined how policies and market conditions have influenced farmers' use of nitrogen fertilizers over the past five decades. Based on their findings, the researchers suggest specific nitrogen use targets based on region and crop type to meet 2050 global food-demand projections and environmental stewardship goals. Currently, the global average for nitrogen use efficiency is approximately .4, meaning 40 percent of the total nitrogen added to cropland goes into the harvested crop while 60 percent is lost to the environment. To reduce environmental impacts, the researchers urge an increase in global average nitrogen use efficiency to 70 percent so only 30 percent of the total nitrogen is lost to the environment. To achieve this goal, the researchers provide examples of specific targets in 2050 for various regions that take into account differences in ecological and socioeconomic conditions. These targets could be used in tandem with the United Nation's Sustainable Development Goals, the researchers write, which were released in September 2015. "Nitrogen use efficiency has been proposed by the United Nations as a way to evaluate approaches that decrease nitrogen losses while maintaining or increasing crop yields. Our work reinforces its potential," said study co-author Denise Mauzerall, professor of environmental engineering and international affairs at Princeton's Woodrow Wilson School of Public and International Affairs and its School of Engineering. "How we feed the planet is going to affect climate, air quality, water quality and biodiversity, so it's critical we do it in a way that is as efficient as possible, or else there will be substantial undesirable environmental consequences." "If we continue the way we've been going, it will lead to an even more significant nitrogen-pollution problem than we have today," said Xin Zhang, the study's co-lead author and a postdoctoral research associate at Princeton's Woodrow Wilson School of Public and International Affairs and the Princeton Environmental Institute. "Our paper provides a framework that farmers and countries can use to easily measure and chart progress related to food security and nitrogen pollution." The research team - which included co-lead author Eric Davidson of the University of Maryland Center for Environmental Science, Timothy Searchinger of Princeton, Patrice Dumas of the Centre de Cooperation Internationale and Ye Shen of the University of Georgia - looked at nitrogen surplus and nitrogen use efficiency across 113 countries over 50 years through the lens of the Environmental Kuznets Curve hypothesis. This economic theory predicts that as a country develops, environmental degradation worsens until reaching a certain average income at which point pollution levels begin to decrease. In early stages of agricultural development in most countries, farming technology does not lead to a more efficient use of nitrogen fertilizers, the researchers found. Because most farmers are profit-maximizing, how they use fertilizer is influenced by price. Therefore, market signals such as the prices of fertilizer and crops, as well as government subsidies play a very powerful role. At later stages of development, however, technology can improve nitrogen use efficiency. In the United States, for example, crop yields have increased over the past two decades without substantial increases in fertilizer use. This was only possible by adopting technologies that increased nitrogen use efficiency, the researchers found. These improved farming technologies included more strategic irrigation, improved seed sources, slow-release fertilizers and better online planning tools. Likewise, the United States' uptick in the growth of soybeans, a plant able to produce its own nitrogen, also plays a role. Policies have been more effective at increasing nitrogen use efficiency in Western Europe than in the United States. For example, the Nitrates Directive, which was implemented in the 1990s, limited farmers' use of manure and the application of fertilizers near water or on slopes to reduce water contamination. This significantly increased nitrogen use efficiency while also improving crop yields. The turning point for these countries began in the late 1980s and through the early 2000s, directly coinciding with changes in the European Union's Common Agricultural Policy, which contains several monetary and regulatory policies designed to reduce nitrogen application on cropland. At the other extreme, countries like China and India have gone downhill in terms of nitrogen use efficiency, owing to heavily subsidized fertilizers, which reached $18 billion per year in China in 2010. Because fertilizer is so cheap relative to crop products, farmers tend to use excess quantities to insure higher crop yields. China also produces increasing amounts of fruits and vegetables, which generally lead to more nitrogen in the ground and air than cereal crops, like wheat or rye. As a result, China's nitrogen use efficiency has been steadily decreasing leaving it now among the lowest in the world with excess nitrogen leading to substantial environmental degradation. "China now recognizes the human health consequences of environmental degradation, and they are making impressive efforts to reduce emissions of traditional air pollutants," Mauzerall said. "But in a similar way, excess nitrogen application on crops is contaminating their air, groundwater and rivers in part because they over-subsidize fertilizers." Sub-Saharan Africa is an entirely different story altogether. In Malawi, crop yields are low mainly due to the lack of access to nitrogen fertilizer, which is often unaffordable and difficult for farmers to obtain. In this case, fertilizer subsidies could actually help increase crop production without leading to significant environmental degradation. Providing African countries with access to better farming technologies and fertilizer could help feed their growing populations without bringing additional land under cultivation and with minimal other environmental effects. "Our research is really asking: do you have to go all the way to environmental degradation before you see the light and turn around?" Davidson said. "Is it possible for some developing countries, like those in Africa, to follow sustainable development pathways that don't pollute while they develop?" While ambitious, the goals highlighted by the researchers are attainable, especially if adopted as an indicator for the U.N.'s Sustainable Development Goals. "This is challenging, but depending on the international commitment for agriculture education and technology transfer, it is much more feasible than it seems," Mauzerall said. The authors stress that the solution isn't entirely technological. "A lot of this comes down to understanding the sociology and economics behind farmer decision-making," Davidson said. "We need to figure out how to help farmers adopt technologies that reduce pollution while still producing their needed profit outcomes." One way to address growing global food needs is through stronger collaborations and investments in research and human resources, the authors noted. This will facilitate knowledge sharing, creating political and market environments that help incentivize the development and implementation of more efficient agricultural management technologies. In the case of Sub-Saharan Africa this will be enormously helpful in producing sufficient food while preserving native ecosystems and biodiversity, while in China it will be tremendously valuable in reducing nitrogen pollution of water and air while maintaining crop yields. The paper, "Managing nitrogen for sustainable development," was published online Nov. 23 as a Perspective piece in Nature. How much fertilizer is too much for the climate? Yah? No! The only thing that would stop global Malthusian collapse would be limiting population growth. And limiting is not going to happen, too many taboos are against it.